Hello! Thank you for stopping by. I do appreciate your visits - I would love it if you left a comment to let you me know you were here. The latest revisited sketch is up at Tuesday Morning Sketches, this week is Jenee's pick. I love this sketch, too. My card features lots of dies. Some of the newest ones from Concord and 9th, flowers are from Spellbinders, stitched oval and the tag are from CC Designs. I die cut them all out of white card stock and colored them using various colors of Distress Oxide inks. The sentiment is from Believe Script by Pink and Main. In hindsight, I do wish I'd embossed the tag panel to give this card a bit more texture. But other than that, I'm pretty happy with it. My go to colors lately are teal, turquoise and purple. Please join us at the Tuesday Morning Sketches blog - I'm sure you'll this sketch a lot, too. Please leave some love for the team, they work so hard to bring you inspiration. Thank you for stopping by. This week's challenge on the Facebook group "I'm going to use up my stuff 2019" is watercolor. These were the easiest cards to make, especially using the sketch from CAS(e) This Sketch. This isn't exactly how I started to make this card. I intended to emboss the sentiment but there was just way too much pressure in the Gemini that it cut part of the paper and the rubber mat! So I just went with it, cut the sentiment - which is a small die of the month from Spellbinders. 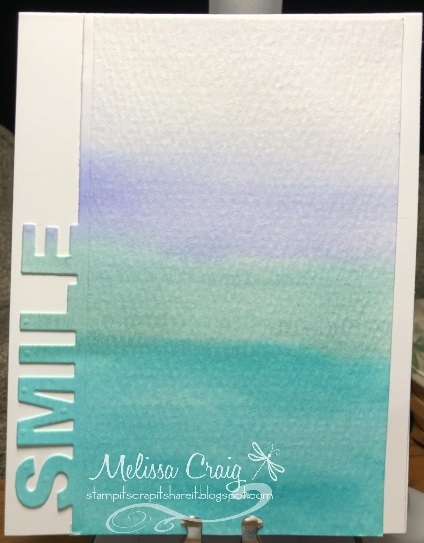 I used Distress Ink and Ranger watercolor paper. The colors are used are Shaded Lilac, Evergreen Bough and Peacock Feathers. And since I made one, I decided to make two. Hello! Thank you for stopping by. This week's revisited sketch pick is Debbie's pick and it's another sketch by Janice Melton. I actually did two cards with this sketch. One of my cards, the first one I'm sharing, I actually started a few weeks ago and finally finished it on Sunday morning. Before I get to my card - I had such a wonderful time with my son home. I miss him already. He left in the wee hours Saturday morning and he got back to Japan Sunday night. I am so thankful he got safely and all I can say is I'm hoping this next year and half goes by as quickly as this past year and a half did. I want him stateside. 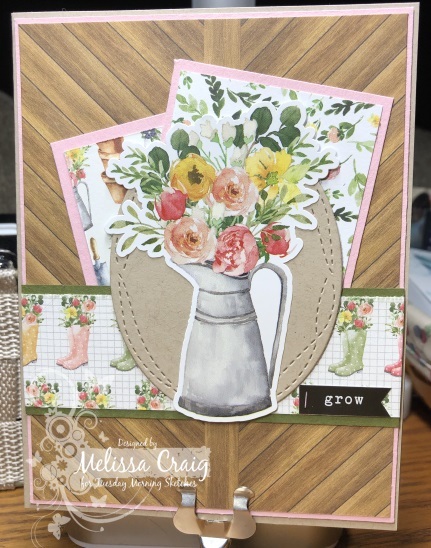 So this first card features papers from a past Simon Says Stamp kit. I can't remember which month. 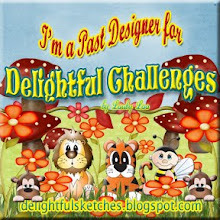 My card also features dies from previous months Spellbinders small die kits of the month. The sentiment is from Simon Says Stamp that I bought during Die-cember. I'm not real pleased with these dies, but I have them so I need to use them. I lightly embellished with some Nuvo Drops. Now, as I said I made two cards with this sketch. I did this while my son was at Universal with friends for a couple of days. I belong to a challenge group on Facebook and the challenge was an animal on the card. So I pulled out my old There She Goes stamps set and I also used some pattern stamps from Sweet n Sassy. This is a one layer card! Yep - only one layer and a whole lotta thought! It's not great but I learned a lot and I will work on perfecting this technique. I used a piece of 110 lb card stock cut to a standard A2 size card. I cut a piece of masking paper down to 4 x 5 1/4 and put it on the card. I colored the unmasked part with some light blue ink. Then I removed that mask and cut the circles. I then stamped the plaid purple square. I then masked it and stamped the border. 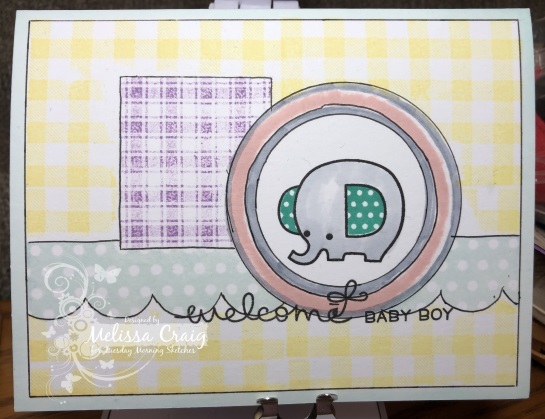 I masked off the border and stamped the yellow gingham pattern. I then pulled off the outside circle and replaced the overall mask back on lining up the circle. I then rubbed the pink ink on - this didn't turn out quite how I wanted. But moving on, I removed the inner circle and stamped my focal image. I tried to add in a bit of gray and proceeded to mess up thin lines so they became what you see. I drew in all the black lines and added a sentiment from Lawn Fawn. As I said, it's not great but hey - I gave it a go. 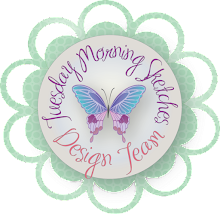 We'll see you over at the TMS blog, leave the design team some love! Thanks for your visit. Hello! Thank you for stopping by. I am not one to make New Year's resolutions - they are like campaign promises. They sound great at the time but when it comes to follow through the promises do a face plant. But I am very much trying to not be so impulsive and a band-wagon with my crafty purchases. I am telling myself I have to use - really use what I have before I make any new purchases. 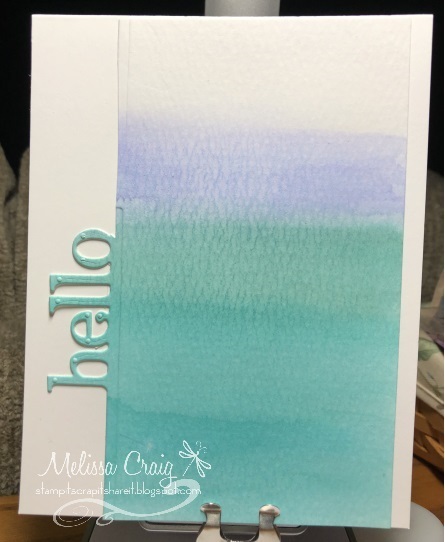 So with that said, my card features the Simon Says Stamp stamp set called Beautiful Day, I think this was in the April 2018 kit. 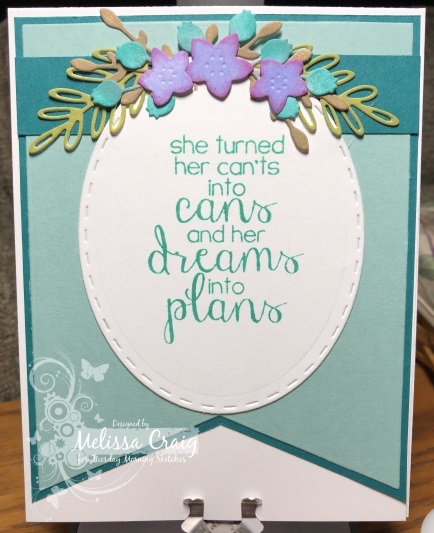 The sentiment is from a card kit I purchased a very long time ago from MFT Stamps. I don't think it's available anymore. The layout is from a sketch at CAS(e) This Sketch. I also made it for challenge group I belong to on Facebook called I'm Gonna Use My Stuff 2019 Challenge. 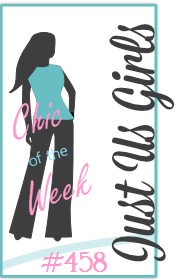 If you'd like to join the group, please head on over. I cut a panel from Neenah Classic Crest Solar White card stock using a stitched rounded corner die from Pink and Main. I stamped the leaves using Moss Green ink by Hero Arts and then using a couple of Prismacolor colored pencils and Gamsol I colored the leaves. 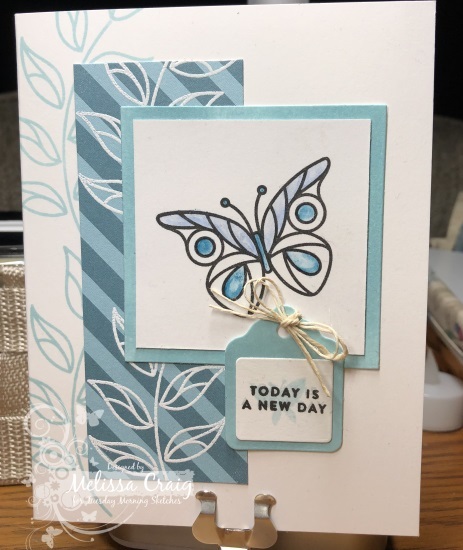 I stamped the butterflies using Hollyhock ink (Simon Says Stamp) and Blue Yonder (MFT stamps). I colored the butterfly bodies with a black Gelly Roll pen. The paper is from an old paper stack and the sentiment I heated embossed with Hero Arts white detail powder. Hello! Thank you for stopping by. It's time to kick off our favorite sketches of 2018 - this week is Andrea's favorite. It's up on the Tuesday Morning Sketches blog along with some great inspiration from the design team. 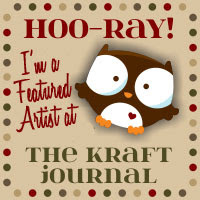 My card features papers and stickers from a past card kit from Simon Says Stamp. I think it was March or April. The papers and stickers are Carta Bella. I really should have cut a larger oval for the focal image because it gets a little lost at the top of the floral arrangement. But overall, it's a nice card - I'm pretty happy with it and happy that I'm using up stuff before I get new. Not a resolution or anything - but I do need to use what I have more often. I didn't take the January kits from either Simon or Spellbinders. Way too focused on Valentine's Day and that is definitely not my holiday. So by not taking those kits, it forced me to use what I have. Not a bad thing! Head on over to the TMS blog for some really great cards made by the team. And then give the sketch a whirl! Have a great day. PS - Enjoying my visit with my son. Time is going by so quickly! It's been great having all 3 of my kids under one roof again. And for the Instant Pot - I love it!! I've made steel cut oats in it, buffalo chicken pasta, pulled pork - but I mentioned a pot roast. Deeee-licious. I followed (sort of) this recipe here. I don't like mushrooms so those I left out and I would say back off the salt if you use the au jous mix. But it was really good, the meat so tender. Hello - thank you for coming back! I have missed our visits. Tuesday Morning Sketches and the card world/art world has lost an amazing artist. It is with great sadness that former DT member, Jessi Fogan passed away on December 27th. This week we honor Jessi by revisiting one of her last sketches. Please join us in remembering her. My card features stamps from Simon Says Stamp and paper from Pink & Main. It's clean and simple card, for the most part. 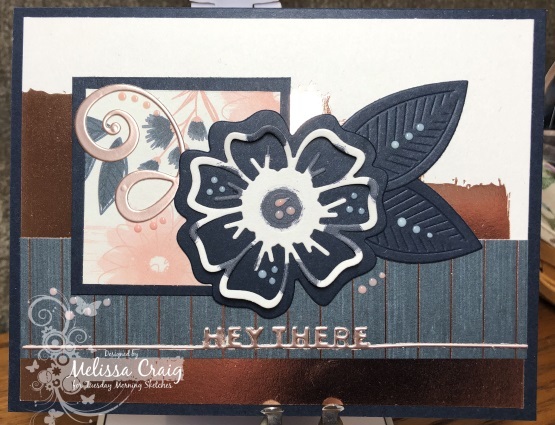 I stamped the base card with the leaves using Surf Blue (SSS) ink. 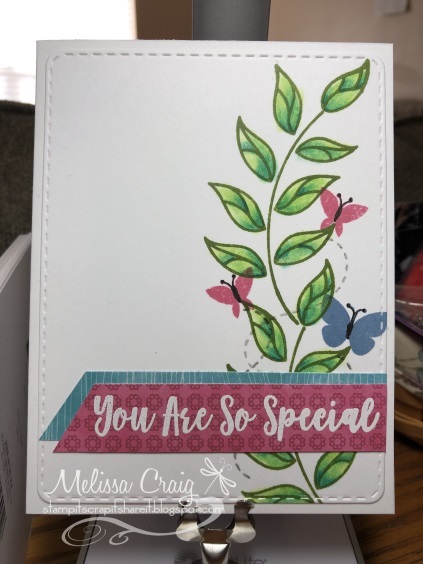 I then stamped the same onto a piece of paper from Pink & Main's Take Flight 2 paper pad and heat embossed with Hero Arts white detail powder. I didn't have a solid paper that matched exactly so I rubbed the ink onto some white paper and then cut out the square mat for the focal image and the tag from a Spellbinders die. The main image I tried using the watercolor pencils I got from Crafters Companion. I really don't like these pencils. They are going home with my daughter. Maybe she can make them look nice. As I write this post - it's actually Monday night at 8pm. 2 1/2 hours and I head out to pick up my oldest son at the airport! Yes, my sailor son who is stationed in Japan is home for 2 weeks!!! I am one happy momma. We'll see you over at TMS blog. 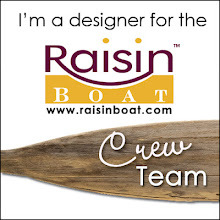 Be sure to leave the team some love!